Our Memphis Heritage Attraction Pass allows you to step back in time and follow the Civil Rights movement with entry into the National Civil Rights Museum and the Earnest Withers Gallery. You will also be able to explore Rock and Roll music with admission into the Blues Hall of Fame Museum and the Memphis Music Hall of Fame. These tickets are self-guided and will allow you to spend as much time as needed in each museum. This Memphis Heritage Attraction Pass provides admission into four attractions that have really created and shaped the History of Memphis. National Civil Rights Museum is steadfast in its mission to share the culture and lessons from the American Civil Rights Movement and explore how this significant era continues to shape equality and freedom globally. 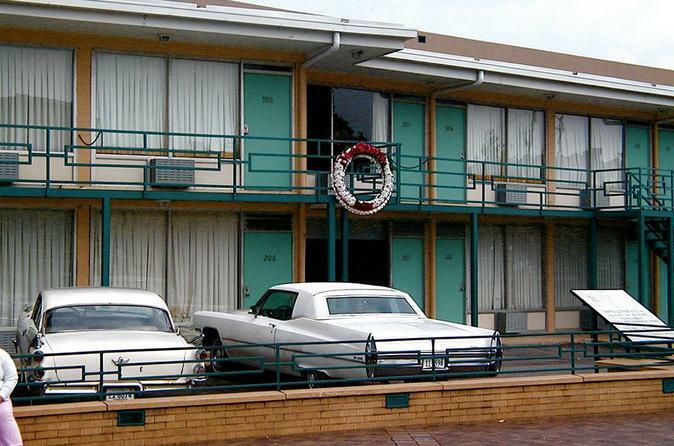 Established in 1991, the National Civil Rights Museum is located at the former Lorraine Motel, where civil rights leader Dr. Martin Luther King Jr. was assassinated on April 4, 1968. Through interactive exhibits, historic collections, dynamic speakers and special events, the museum offers visitors a chance to walk through history and learn more about a tumultuous and inspiring period of change. Ernest Withers Gallery Withers played a key roll in the Civil Rights Movement as a result of his photographic document of the Emmett Till trial. He was witness to the Montgomery Bus Boycott, Medgar Evers Funeral, the Integration of Little Rock High School, the Memphis Sanitation Workers' Strike and the Martin Luther King, Jr. assassination and funeral. Wither's civil rights photographs are known for their immediacy and directness that stems from his use of a normal-focus lens. His nearness to events were not only physical but also ideological. Withers photographed the quiet dignity of Martin Luther king Jr. on one of the desegregated buses in Montgomery, Alabama as well as the violence that marred the strike of the Sanitation Workers in Memphis, Tennessee. He was in the midst of the action. The Blues Hall of Fame Museum celebrates the performers, music, literature and contributors to this great American art form. Exhibits feature guitars, harmonicas and a piano that belonged to blues greats! Also on display are flashy stage costumes, original artwork and historic photos. The interactive touch screens offer fascinating narratives, complete blues recordings, and video clips. This state of the art facility celebrates the lives and the music of each Hall of Fame individual as well as the history of the music and the literature produced through the blues timeline. Memphis Music Hall of Fame introduces you to the heroes of Memphis music. It’s a fun, interactive experience that’s as outrageous as our Hall of Fame inductees. More than a century ago, music began pouring into Memphis, Tennessee. Musicians of all races and backgrounds came together and, for the love of music, created a sound that changed the cultural complexion of the world forever. America’s music exploded out of Memphis. Today, the Memphis Music Hall of Fame honors many of the greatest musicians of all time, who created this city’s musical legacy, and who shook our planet to the core!